Soapy suds gushed from the under the door of my dishwasher, pouring across the kitchen floor. I shut it off immediately and tried to stem the flow with hastily grabbed towels. I almost cried. I love my dishwasher. My dishwasher is my friend. It was late. I went to bed. I’ll deal with it in the morning. This morning I pulled the dishes out and washed them by hand. My husband is on day two of a nasty cold so I don’t want to bother him about fixing it until he feels better. My hands deep in a sink full of dishes and sudsy water, I thought about how important the dishwasher is as a tool in my weight loss journey. When you’re eating healthy, you use a lot of dishes. 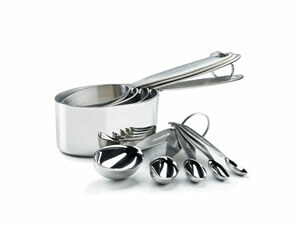 Measuring spoons and cups. The tray on the food scale. Pots and pans. Blender. Plastic containers for weekday lunches. A dishwasher is a huge time-saving device with all this critical clutter. When you’re eating unhealthy—fast food out of paper bags—there are no dishes. Just a lot of trash. Or when you’re eating out a lot, someone else is doing the dishes. My method is Lindora. There are lots of great programs out there: Weight Watchers. Slimgenics. Paleo. Body for Life from EAS. Websites like Spark People. Do some research. Find a plan that works for you. Don’t have surgery. You can do it the right way if you really, really want to. You got yourself into this mess. You can get yourself out. But you need a plan. A way to measure your food so you won’t lie to yourself. A lot of those dirty dishes I mentioned have to do with measurement gadgets. A huge key to weight loss success is heightened awareness of what you’re doing. If you guesstimate how much a cup of skim milk is without measuring it, you’ll always err on the side of too much. If you think one ounce of almonds is a handful, you’ll wind up eating two. Measure everything, stay within the boundaries of your program, and you will lose weight. 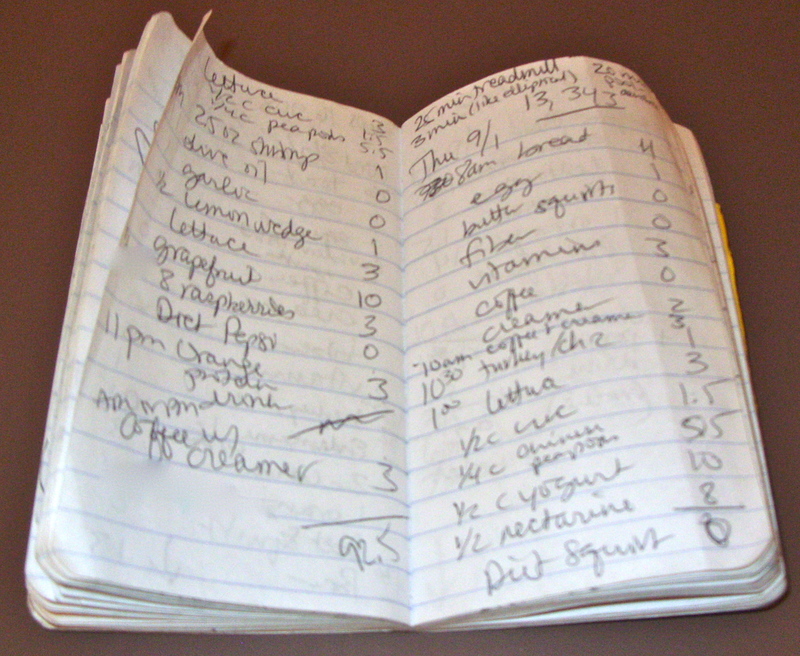 Another critical weight loss tool is a food diary. Write down everything you eat. Nothing formal. Scraps of paper. A small notebook in your pocket or hand bag. It’s like accountability to yourself. An honest food diary keeps you centered squarely in the world of what is real. I like this little notebook I got at WalMart for 50 cents. I especially like that it doesn’t have spiral binding. Treats… I mean, protein supplements. My favorites include ZonePerfect nutrition bars (Cashew Pretzel and Chocolate Mint) and Lindora’s protein drinks (Wildberry Passion) and nutrition bars (Peppermint Cocoa Crunch, Chocolate Mint, Chocolate Chocolate). These keep me satisfied and happy on this long, long journey. 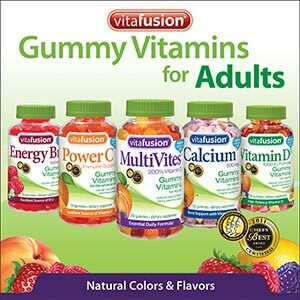 Vitafusion MultiVites – Gummy multi-vitamins for adults. I hate, hate, hate swallowing vitamins. For years, I refused to take them. My husband found this brand at Costco for me a few years ago. They’re like candy. B-12 Sublingual – Just bought a bottle at my doctor’s office. Stuck a pill under my tongue this morning. Mm! Grape! I miss the B-12 shots I received while on the Lindora. B-12 helps increase your mood, metabolism and energy. Sugar-free Metamucil Fiber Supplement. 1 teaspoon per day with 4 oz. of liquid. To help it go down better, I mix it with any flavor of Crystal Light. It’s like fake juice in the morning. Not bad. I love my Skechers Shape-Ups. I can just feel the rhythm and flow while I’m on the treadmill. I am in the zone. For years we had a room in the house set up with weight lifting and cardio equipment. We never used it. At home there are far too many distractions and reasons not to work out. Going to the gym is both a physical and mental separation. You can focus there. And the energy of people working out around you is contagious. In August we purchased a three-year LA Fitness membership – buy two, get the third year free. It’s called commitment. Lindora recommends moderate exercise; at least 10,000 steps per day. 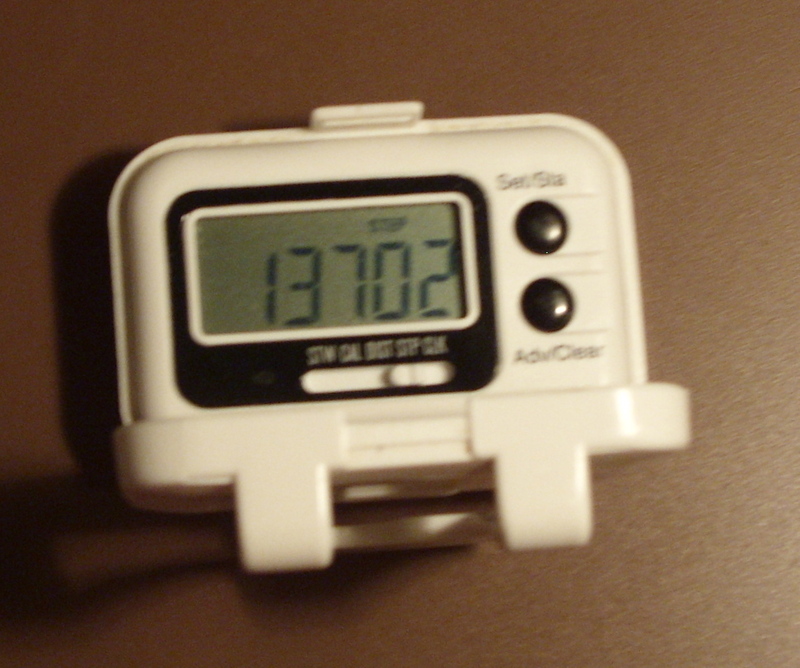 This handy dandy Lindora Lean for Life pedometer (from 2002; no longer available through Lindora) helps me gauge how much I’m moving every day. It’s another way to be stay grounded in reality and to document my efforts. What are your must-have weight loss tools?